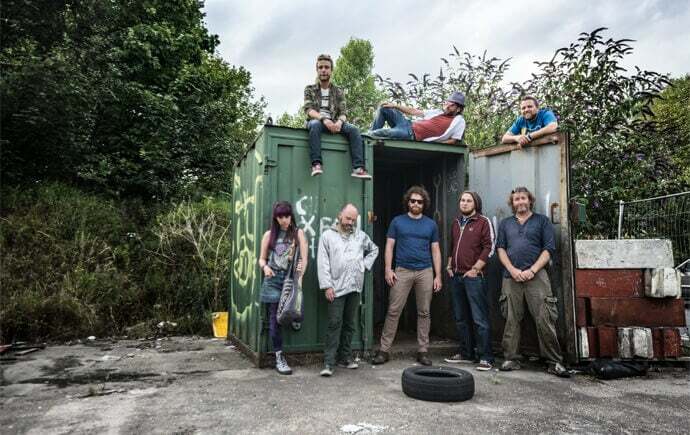 Even though eight-piece reggae fusion band Steel City Rhythm only released their first album earlier this year, the much-loved local outfit are already working towards record number two. Now at the end of a jam-packed festival season which saw them touring up and down the country, we thought it was the perfect time to get them in for an Exposed session while they were all in the same place at the same time. First of all, can you introduce yourselves to the Exposed readers? (Addition of a fun fact is optional). Carl D: I’ve got no fun facts, but I’m Carl and I knock bits of wood together and play the bass in Steel City Rhythm. Ben: I’m Ben, I sing with Steel City Rhythm and I run The Rude Shipyard. Carl W: My name is Carl Watkins, I like to instigate a bit of a Mr Motivator style warm-up before our gigs to get everyone going. Can you do an example? Carl W: *Begins to squat and lunge* Sometimes people chip in exercises so it’s always different. Stevie: I’m Stevie, I forget my words a lot and that’s about it. Marcus: I’m Marcus, sometimes known as Goblin or Goblin King, and I make silly noises over the top of everyone else. Sarah: My name is Sarah, and I play saxophone and work with dogs all day. Joe: I’m Joe, I play the keys, congas and melodica – and any hat suits me. Tom: I’m Tom, I play trumpet and in my spare time I’m training to be a mental health nurse. And there’s Danny, who isn’t with us at the moment, he’s our drummer. Tell us about the relationship between the different genres you incorporate into your music. How do you get them working together? Joe: It’s not intentional; I think that’s why it works. Everyone brings their own styles to the music, although it’s based on reggae rhythms, and different bits get added in. It’s what comes naturally to us, which stops it sounding forced. Tom: We’ve all come from different musical experiences and there are different things that we’re into that worm their way in. Joe: It’s not like other reggae. We break a lot of the rules really. Marcus: I think that is what keeps the dynamic. The fact that we do drop from a very dub section to an extremely fast ska section and back again within the same tune. It emphasises the contrast between the genres and really works despite the mash-up of styles. Joe: Whereas traditionally in reggae and dub you’d stick to the rhythm, lock into a groove and stay there. We like to do a lot of starts and stops – the dramatic stuff. Your music really excels in a live setting. Do you consider this as a main component when writing songs? Joe: We actually tend to only think about how we will perform it live, and then come to do an album with songs that are seven or eight minutes long and unplayable on the radio. Carl W: Doing songs in the studio is very much all of us playing along with each other as if we would be playing live. A lot of the songs have worked out like that instead of sitting down with a pen and paper and writing quavers and stuff. And what will you be performing for us? Tom: We usually do absolutely everything with painstaking votes. Although it’s tedious and it takes a long time, that’s the kind of democracy we like in the band. Anything like a setlist, what we’re going to put on a record, whether we should do gigs or festivals, and what song we’re going to play will be hotly debated. It will probably end up coming down to a vote. Sarah: But it’ll be something that isn’t on the album. Joe: Yeah, something that hasn’t been recorded anywhere else. What makes playing in Sheffield differ from anywhere else? Stevie: If it’s a smallish venue and it’s intimate that makes it better. Sarah: We have some regulars now too. Tom: We always love playing Sheffield, just getting out there. We love the city. We’re named after it aren’t we? We love playing local festivals like Sharrow and Heeley, that’s the kind of community where we started and it’s something we would always want to carry on doing. Whatever we do across the country, those are always really important gigs to us, making sure we play the local scene that’s fostered us. What do you think is the best thing about that local scene? Marcus: It’s a melting pot, and there are no barriers between the genres. You get metal heads jamming with reggae heads, funksters jamming with indie kids and everyone learns from each other. The big music scene is what has held me here. People are so open-minded in Sheffield compared to other cities where it’s very much this genre sticks to over here and that genre sticks to over there. In Sheffield it’s much wider and you get people interacting with each other and it produces fusions like Steel City Rhythm, where people are coming in from different backgrounds and bringing what they know to the table. Sheffield is unique in that respect. Carl W: Sheffield has got such a good underground scene. You find new people and then ask what they can recommend, and from that you find some amazing bands on the real underground scene. Marcus: That is what makes Tramlines such a great festival, you could pretty much ignore the main stage if you wanted to and still find such a wide range of music. Carl W: There are some fantastic community festivals in Sheffield as well. Tom: People who have a real passion for just putting music on and having those big parties. Festivals like Peace In the Park and Sharrow Festival we’ve been going to since we were younger and always aspired to play. Without getting into proper hyperlocalism, Sheffield has that little town scene going on. You do bump into everyone you know on the bus or in The Washington at a gig. 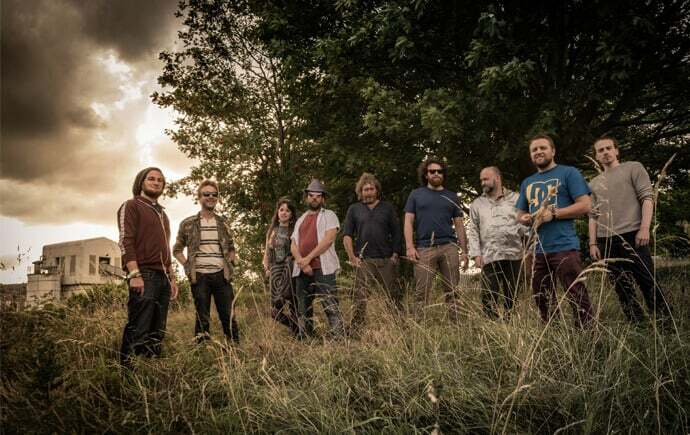 And finally, what is on the cards for Steel City Rhythm now festival season is over? Joe: Hopefully we’re going to get in and record another album soon, really soon. We have a few shows dotted about before the end of the year as well. Tom: We always underestimate how long things are going to take but we’ve got a full set of stuff that we’re really excited to record and we’re now thinking about how we want to do it. So we’re just working towards that release and then hitting it again next year with a load of festivals.